Dreamy creamy chia pudding! 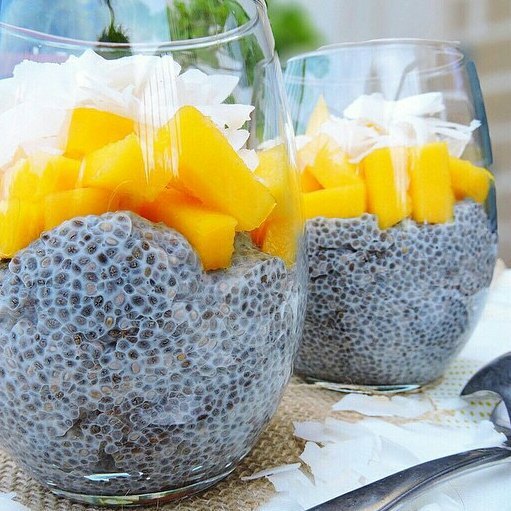 If you haven't tried this yet, you need to jump on the chia wagon. Share with the kiddos too! It's kid friendly and husband approved too!! All recipes here are! In a bowl, mix the coconut milk, chia seeds, and maple syrup until well combined and set aside at room temp for half hour. After half hour, mix the ingredients once more and store in the fridge for a few hours or overnight in an airtight container. Once you're ready to serve, divide into two cups/bowls, layer with mango and shredded coconut and enjoy chilled! If you're following the 21 Day Fix, it equals 1 1/2 purple (mango, coconut & maple syrup) & 1 blue.